Arizona’s seasonally adjusted unemployment rate was unchanged at 4.9 percent again in April, according to the latest report published by the Arizona Office of Economic Opportunity. The national rate declined from 4.1 percent to 3.9. Twelve months ago, the state had a seasonally adjusted rate of 5.0 percent, and the national was at 4.4. The state had a net gain of 5,300 non-farm jobs over the month. The private sector gained 3,300. Nine of the 11 sectors tracked showed gains. Trade, Transportation & Utilities was the biggest loser, dropping 3,100. 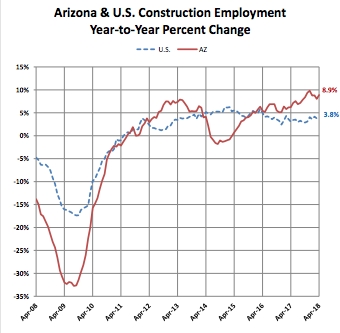 Construction in Arizona was up 2,500, tying with Leisure & Hospitality for the largest gains. Courtesy of Arizona Department of Administrationof 17,700, up 1,300 from April, 2017. Specialty Trades was up 1,300 for the month at 104,200, and the segment increased 56,700 over the year. Construction jobs in the Phoenix Metro Area (Phoenix-Mesa-Scottsdale) increased 1,800 over the month, for a total of 121,400. The March 2017 number was 110,400. In Metro Tucson construction job numbers increased 200 to 16,700, an increase of 1,100 from March, 2017. 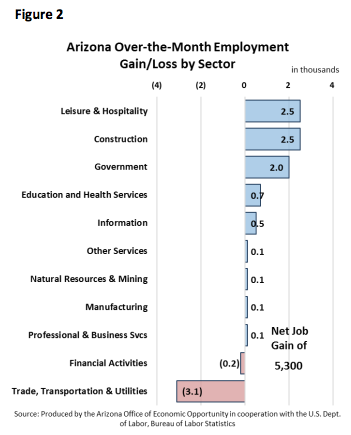 Yuma, Flagstaff, Prescott, Lake Havasu City-Kingman and Sierra Vista-Douglas combine Construction and Natural Resources jobs in reporting their job sector totals. Yuma was unchanged at 2,500, as was Flagstaff with 2,400. Prescott increased 100 to 5,500, as did Lake Havasu City-Kingman for a total of 3,100. Sierra Vista-Douglas stayed the same with 1,500.